We recently celebrated the official opening of our new studio in 1A King Street Bendigo. More than 40 people attended a range of classes throughout the day helping to raise funds for the Bendigo Community Toy Library. 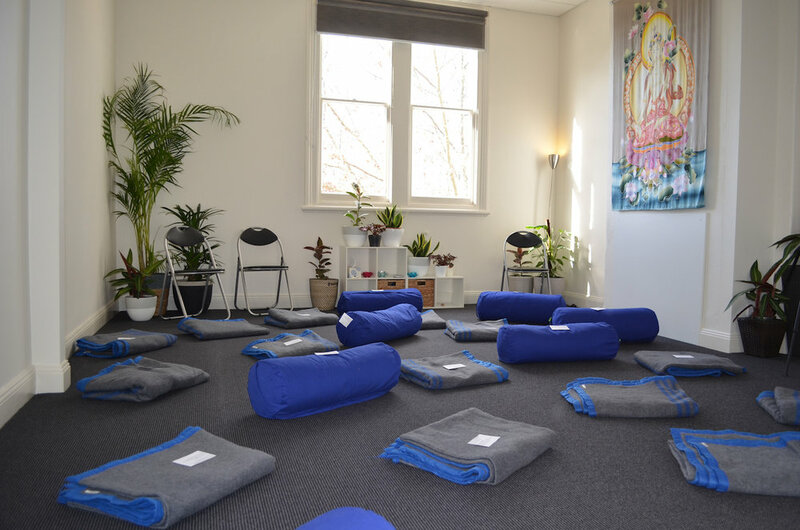 The official opening was guided by Leigh Blashki, who is widely regarded as the father of yoga therapy in Australia. He has also been a wonderful teacher, friend and mentor to me over the past eight years. We broadcast the official opening live on Facebook. Here are some excerpts from the day as well as a list of very special thankyou’s. I did my very first yoga class in Studio 2 just along the west wall. That was in the late '80s with a lady named Shirley Murray. After Shirley, there was Kehry who held Vitality classes here as well a man called gunta who taught yoga here as well. And who knows what else has been here and what they've been doing within this space. I think we're in a really good space with all that wonderful yogic energy having been here. I feel honoured. And to be here, where it started for me, I can't really tell you how amazing that is to be back in this space to be sharing yoga with all you guys and to be doing something I really love. It’s come full circle. Today is about YogaHara, and about YogaHara's Pracharya. Now the word Pracharya; you might have heard the word Acharya which basically means teacher. But Pracharya is only given to small number of people. People who are actually central to a hub of teaching, and Gina is a Pracharya. If you look it up in a Sanskrit dictionary, the word Acharya implies wedded to something; wedded to the teachings because of the living nature of the teachings and the wisdom that comes from the teachings. The word hara is about the centre. It's a hub in the physical body. The hara, much like the geographic centre of our body, is where there's the greatest stability and when you have a Pracharya that has a studio and a life practice, YogaHara it is a place to be, a hub. Not just for coming to do a yoga class but to feel like this is your little hub and home of yoga itself because yoga's not just a practise, it's a destination, it's the journey, it's a whole range of things that seems like coming home to your own unique sense of non-separation with all these. 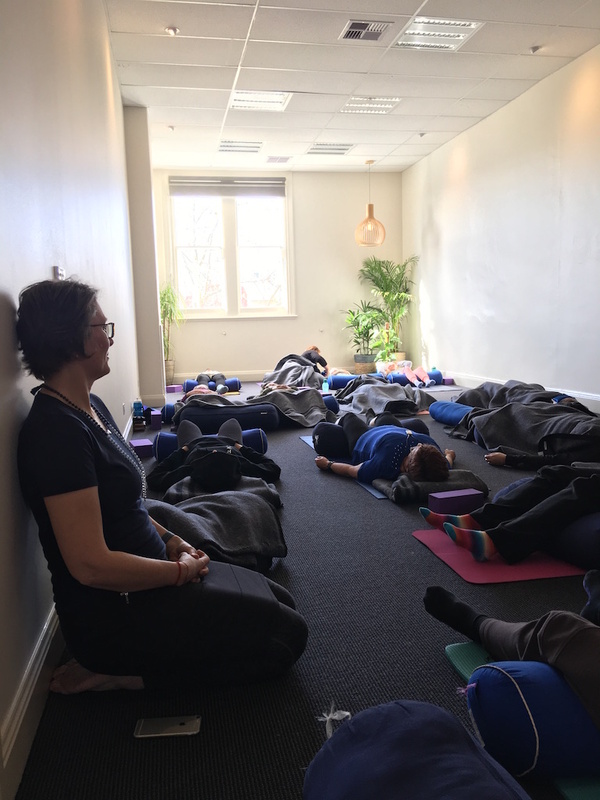 And how wonderful that Gina's first class was here when she was a simple neophyte before she became a Pracharya, and with all these teachers sitting right here there must be 100 years of teaching experience in this room. What a perfect place for a hara of yoga. As a person who has committed to yoga, there is no higher honour or privilege than to assist with the inauguration of a new hara, a new centre. And it is with the spirit of that which I take on the assisting role of a little ceremony. In the last few months, David and I have put so much of ourselves into making this happen. There are a few people we would like to thank. Russell Parsons Builders - Not a single thing I said seemed to worry him or he couldn't make happen. I just said, "I'd like this wall removed and I'd like that to happen." Russell said, "Yup, yup, yup." Even though there were a few hiccups, he didn't once make me feel like it was any drama. Mark Dennis, from Mint Signs - I can't talk Mark up enough. He was incredible. All of the detail work on the doors, the door trim, the outside of the building, all the writing on the walls; Mark did all of that. And he is the most professional tradesman I've ever come across. I never knew him before this. He's amazing. I can't talk up Mint Signs enough. Heather Purtill from Libertine – Heather is responsible for all the greenery within the studio as well as the gorgeous weekly blooms we have from Libertine Florist. Ellie Ritchie from The Style Exchange – Ellie is the interior style. She was really helpful and very gracious with us. I’d say a silly idea and she'd just be very kind in her way of telling me it wasn't exciting. She was very good at that. Kimberley Furness from Write Style Communications – Kimberley has taken a huge load off my plate in this past month while I've tried to make this happen, being in charge of our social media. And we were just discussing how great that's been because everybody still thinks it's me rather than her. She’s done a fantastic job at sounding like me so that's a real testament of her skill. Cindy Lazenby - Cindy has been a friend of ours for a long time. She's looked at every building I've looked at for the past three years. And we finally both walked into this one, and straight away there was something. We just kind of knew. And then I told her that I went to my first yoga class in this building, and she said, "I think this is the right one". And it all just fell into place. Daniel Macauley - A pretty important thank you in this process of making it happen is my gorgeous son, Daniel. Daniel's responsible for all of the furniture in the studio. He made all of this and I just think he's done such an extraordinary job. I'm so proud of him. I love him so much and I can't really thank you enough for this work. And to the YogaHara teachers, who are all incredible - Donna, Peta, Claire, Maxine, Sally and Nina. Thank you for being part of the YogaHara family.